So Gordon moved into the Mirage household, bringing with him a tidy not-quite-20 grand and the attendant — and very welcome — house expansion. With Elderhood just 3 Sim-days away for Gordon (and Parcheesi about to become an Adult herself) and me thinking Elders couldn’t procreate, ‘Cheesi was feeling the whisper — or rather loud wailing — of her biological clock. 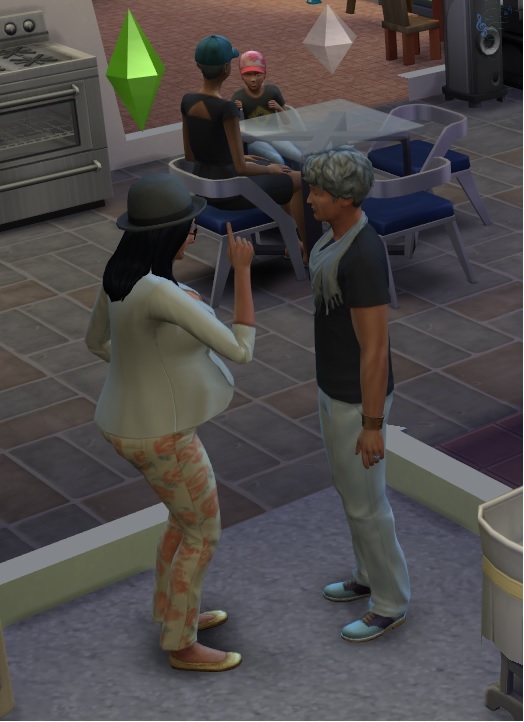 Fortunately it didn’t take long to get pregnant (and the toilet-click pregnancy tests are an amusing touch), and then in one of those typically-Sims moments, everything sort of happened at once. Gordon officially got OLD, and had to have a birthday party to mark the occasion. By that time Parcheesi was heavily pregnant. Just as the last birthday guest went home, the game told me it was about time I aged up Parcheesi… and just as she was eating her slice of home-made cake the next morning (no party for her, and the game wouldn’t let me age her up on the same day as her spouse, or something), she went into labour. 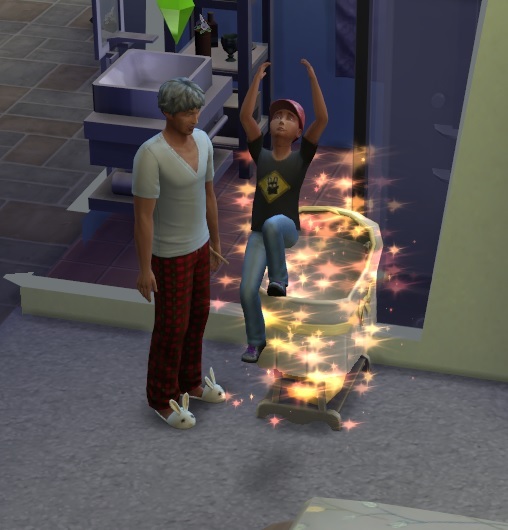 Babyhood is a lot simpler in Sims 4 than it used to be. Babies are currently tied to their crib, and the crib offers all the available interactions — from bottle- or breast-feeding to diaper-changing, rocking and other coochie-coos. It’s not ideal but it’s simple and for now it is what it is. 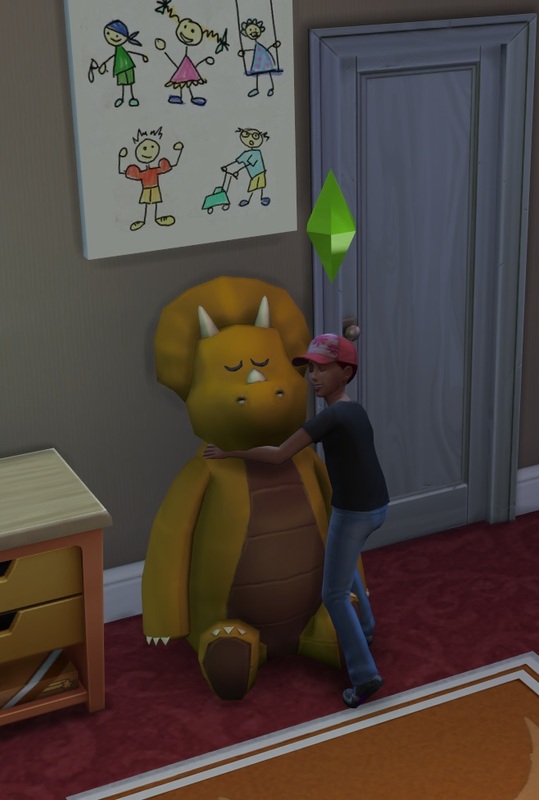 It’s the transition from baby-in-crib to fully-formed 5-year-old I found the most jarring, because no toddlers in Sims 4 (along with no swimming, as has been amply whined about elsewhere). In fact, here’s a picture of young Holdem Mirage doing that fully-formed leap, and Gordo looking justifiably creeped-out. Life went smoothly for a bit after that. Everyone is healthy and actually really happy (not sure how I’m doing it, but everyone is pretty content in the Mirage household), apart from the occasional heart-attack scare when Gordon insists on going out for a jog only to realise that he’s not as young as he used to be (which the game translates as an extremely uncomfortable OMGAMIDYING? moodlet). Gordon remains jobless by choice, spending his days gardening, raising Holdem, painting (a new hobby) and mixing the occasional Salty Llama. The new addition, Holdem, is a good kid. The random generator gave Holdem the “Gloomy” trait and the “Artistic Prodigy” aspiration, which I though was pretty fun. I don’t know how the child of two Good (and permanently cheerful) parents got “Gloomy”, but it immediately set him apart with his own budding personality; and the Artistic Prodigy aspiration was perfectly in line with a Concert Pianist mother and an amateur painter father. Even then, Holdem’s gloom has a had time expressing itself, and he spends most of his time totally happy too. The only thing that worries me is that he has no visible child friends – presumably he has some in school, but he’s never been to the park and therefore has never actually met any children while being actively played. So a visit to the park is on the cards, provided Mom can get the day off and Dad doesn’t pop his clogs. Which isn’t a remote possibility. The game keeps telling me Gordon’s days are numbered and he’d better have his affairs in order, so I’m guessing it will be soon. I know Parcheesi will plead for her beloved’s life when the Reaper comes calling… IF she’s at home. Her work schedule is tough right now. Most careers have you working only 3 or 4 days a week by the time you hit level 9, but she’s still pulling 7-hour shifts 5 days a week — and to make matters worse, the rapid promotions screwed her work schedule up so badly that she only had 2 days off in the space of 3 game weeks. Parcheesi is getting a bit frazzled, I can tell you. And it’s not about to end. Because the “Try for baby…” option was still available on the bed, and wanting to see if it was a bug or a real possibility, Parcheesi decided to seduce Gordon (not a difficult feat) and sure enough, she got pregnant. And that’s where I left the Mirage family. I’m waiting to be able to get in a good long play-session for the next installment, because I know Holdem is about to get a brother or sister and Gordon is likely to die. But so far, so good. It’s not the story I thought I would tell when I started Parcheesi, but it’s not entirely unexpected either. I did say she was driven, and basically work is most of her life — she loves her child and her husband, but her true love is music; and that’s only likely to become more the case when Gordon dies… but then, who will take care of the kids while Cheesi is at work? What new trait will Holden acquire when he ages up in 10 or so days? 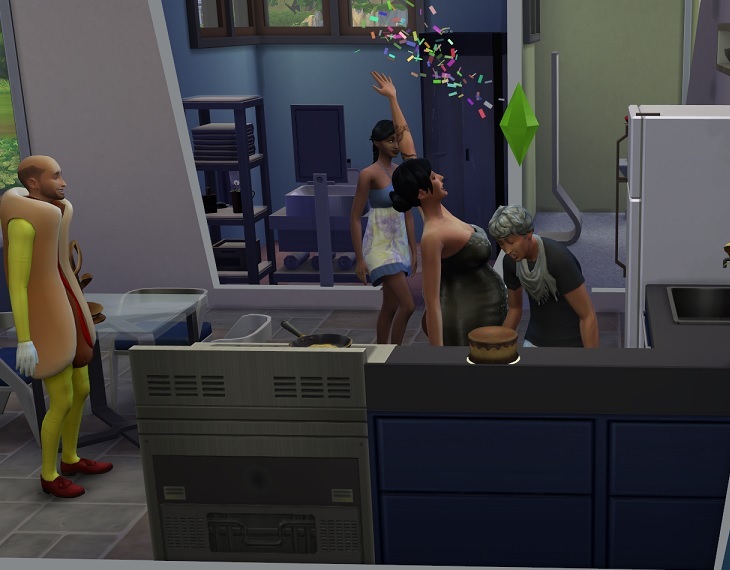 The Legacy Challenge has definitely been entertaining so far, and it provides a unifying framework for the storytelling part of playing a Sims game. With a good ‘reason’ to play more than one Sim, I’m finding it less difficult than I used to, though I’ll admit I haven’t really left the home lot since the first child was born because every member of the family has so many things they’d like to do, but you can only play one at a time if you move them to different locations. That’s definitely a downside with the new Sims. Actually, I’m aiming to do a sort-of review post within a few days. There are good differences and less-good differences from Sims 3 that might bear a closer look. 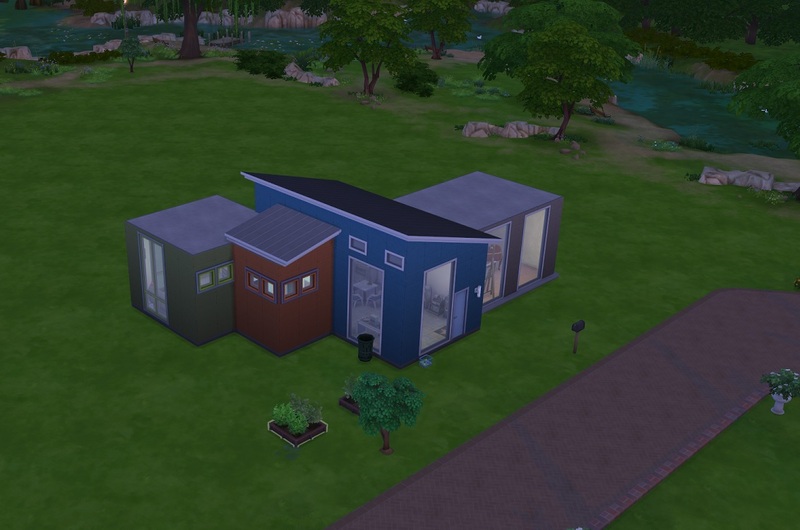 Sims 4 Legacy Challenge – Go Forth And Procreate!